Located along the Sea of Japan coast in the Chubu Region, Toyama Prefecture is surrounded on three sides by precipitous mountains, with the enchanting Toyama Bay – serving as a gateway to the Sea of Japan – on the other. Often overshadowed by its more popular neighbor, Kanazawa, Toyama (a 15-minute ride on the Shinkansen from Kanazawa) doesn’t have the charms of a well-preserved Edo district or a famous garden like Kenroku-en. But those willing to veer off the tourist track in the direction of Toyama will discover a more authentic Japanese experience away from the crowds, rich in traditional crafts, and in an area just as abundant with natural beauty as the popular tourist spots. As many sites of interest are off the beaten path with limited public transport available, the most convenient way to explore Toyama Prefecture is by rental car. A 35-min drive from Toyama Station, Takaoka City has a more than 400-year tradition as a center of industry and traditional crafts dating back to its founding by Toshinaga Maeda, lord of the Kaga Clan, in 1609. This is proudly continued to this day at the Takaoka Regional Market Center, which is hard to miss due to the two large Buddhist statues that tower over the parking lot. Here, you will find a collection of the crafts Toyama is renowned for all in one spot, including copper utensils, Takaoka lacquerware, and Inami wood sculptures. The highlight is the chance to make your own copper utensil, such as a sake cup. Take part in the process of pouring molten metal into a hollow mold, set it to cool, then sand it down to a smooth finish. The best part is that after you finish, you can bring it to a local izakaya to break it in with a free cup of local sake! A 12-minute drive from the Takaoka Regional Market Center is one of Japan’s national treasures, Zuiryuji Temple. Dating back to 1645, the building’s unique architecture was influenced by styles of the Kamakura Period, which drew from Chinese architectural styles when Zen became popular among the samurai class. While in the area, make sure to check out the Takaoka Daibutsu – one of the three great Buddha statues of Japan, along with the 13-meter-high Great Buddha statue in Kamakura and the Daibutsu in Todaiji Temple, Nara. The Takaoka Daibutsu stands an imposing height 15.85 meters (including the base) and weighs 65 tons. What makes it unique is that was crafted using traditional copperware techniques, which Takaoka is famed for. If traditional crafts really are your thing, then it’s worth making a stop at the Himi City Museum while heading up the coast. They feature a permanent exhibition on Fujimi basket weaving, which will be instantly recognizable to those familiar with the Toka Ebisu Festival in Osaka. The wicker baskets that hold the Lucky God have been used for a variety of purposes in Japan for ages, but now are a dying tradition. For one of the most spectacular sunrises you are likely to witness in the land of the rising sun, treat yourself to a night’s stay at the Umi Akiri Hotel on Toyama Bay. Stay in a traditional Japanese room and sample the freshest seafood delicacies the area has to offer including fresh abalone. Don’t forget to wash it all down with local Tateyama sake in your new sake cup. Whatever you do here, be sure to set your alarm for sunrise and head to the open-air onsen, where you will see an unforgettable sunrise over Toyama Bay. Heading away from the ocean and into the mountains, you will find the UNESCO World Heritage Site of Gokayama Village. 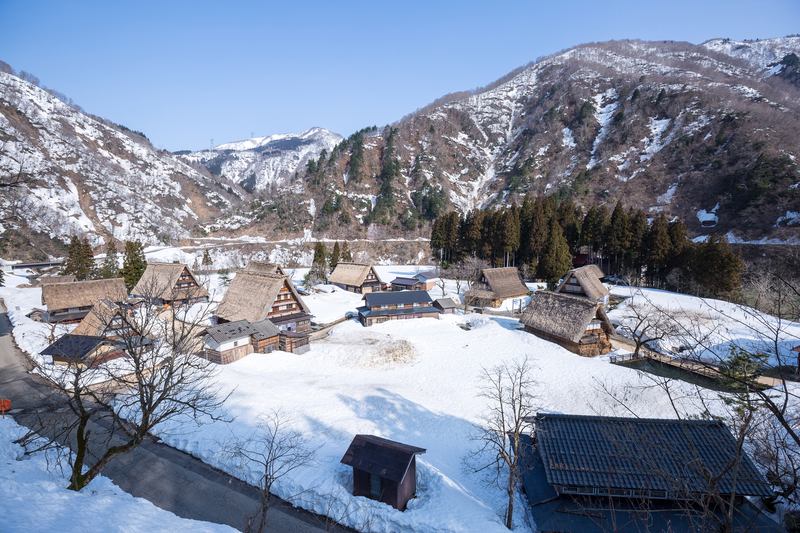 The name meaning “five valleys,” the village is famous for the gassho-zukuri thatched-roof houses, easily recognizable form their slanted A-frame slopes. These houses draw huge crowds to Shirakawa village in Gifu Prefecture, but the difference with visiting the gassho-zukuri in Gokayama Village is that you’re likely to be able to take a perfect postcard picture void of any other tourists. After admiring Gokayama’s thatched-roof houses, make your way to the nearby Gokayama Washi Taiken-kan (papermaking center), where the Gokayama washi handmade paper tradition is passed down by the local people of the area. At this papermaking center, you can learn about this traditional craft that goes back more than 1,200 years and take a class in English where you can make your very own washi paper postcards, bookmarks, or hand fans for a true one-of-a-kind souvenir. After your class, book in some relaxation time with a boat tour through the Sho River Gorge. Take the Shogawa River Cruise from its pick up point at Komaki Dam and then kick back and relax as you drift down the calm waters through the Shogawa River Valley. Let the large looming mountains and picturesque landscapes serve as your backdrop as you make your way to Omaki Onsen. Standing in total isolation on in the shadow of the Shogawa River Valley, the river-side Omaki Onsen Kanko Ryokan is only accessible via the Shogawa Riverboat. After docking, you are greeted by staff in traditional kimono, and once there, all you have to do is surrender yourself to the pure secluded bliss with both indoor and outdoor baths making for an unforgettable onsen experience. Turning a traditional wooden plate at the Inami Wood Carving Composite Hall. Photo: Jason Haidar. The town of Inami, which has a history of wood sculpting that dates back over 250 years, lends its name to the traditional craft of Inami woodcarving, which is recognized as a National Traditional Craft of Japan. The town was built up after disaster struck the nearby famous temple of Inami Betsuin Zuisenji. The temple was destroyed by a fire in the middle of the 18th century. A master carpenter named Sanshiro Maekawa was sent to oversee and train workers to rebuild the temple. Local legend links back to this as the start of the Inami wood carving tradition, which is now known all over Japan. Inside the Inami Wood Carving Composite Hall, you can marvel at a collection of over 200 masterfully crafted Inami wood carvings, both on exhibit and for sale. Admire intricately carved ranma (the panel placed above lintel between two rooms), a shishi-gashira (lion dance mask), or even a massive wooden dragon guitar worth 2 million yen! There is something for everyone. Master Carpenters here mainly use camphor tree, zelkova, and paulownia timber. From start to finish, they utilize around 200 different chisels. If you wish to channel your inner woodworker, you can sign up for the wooden guinomi carving experience where you can learn from master craftsmen how to make your own wooden smartphone speaker, postcard box, accessory case, or drink coaster, all within about an hour and using traditional Japanese carving tools. This beautiful lakeside location is more than just a viewing platform for Japan’s most iconic mountain. World-class onsen, abundant history, and spectacular scenery make Hakone an ideal choice for a spring getaway. Escape to Hokkaido’s winter sports haven.